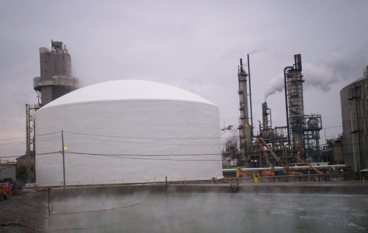 Industrial and Commercial Insulation — Coatings Application & Waterproofing Co. The Insulation Division is a full service Industrial and Commercial Company. We perform all types of Industrial and Commercial Insulation. This includes Ammonia Cryogenic Sphere’s, Ammonia Tanks, Butane/Propane Tanks, Liquid Carbon Dioxide Tanks, Caustic Tanks, Water Holding Tanks, Exterior & Interior Air Barrier Insulation, Freezer & Refrigerated Buildings. We are able to evaluate existing conditions, furnish recommendations and solutions and implement the recommended work. Energy cost factors heavily in the bottom line of manufacturing cost making the proper insulation system critical. 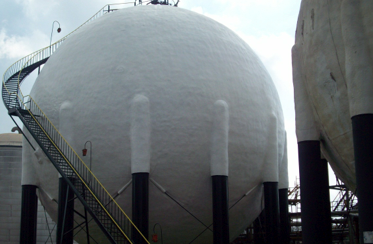 Given the unusual shape of the tank makes the application of the insulation also critical. Analyzing each and every tank taking consideration of existing conditions i.e. surrounding area, JSA job safety analysis, access to the tank, existing surface profile, environmental challenges and nondestructive testing of the tank integrity. CAW takes pride in our analysis of each and every tank before, during and at job close out. Energy cost factors heavily in the design and specifications of new and retrofit construction. Not only does urethane foam have the best insulating “R-Value” in the industry, it also provides the best air barrier qualities. Whether specifications are to be interior or exterior, CAW will provide superior quality application and do in a safe manner.